It is certainly a reasonable question to ask why you would require an initial consultation to commence a Pilates program – I mean aren’t you simply starting an exercise class much like the gym? NO – not really! Pilates is certainly about movement and exercise but what you will see in a more traditional Pilates studio is a mix of equipment and class options. We are all about designing a program that fits your needs and goals and like anything new, we as humans need to spend time learning how to perform the exercises correctly – if we are never taught how to move correctly then we may not achieve the results desired. Your initial consultation is about both you and your instructor. As an instructor we want the opportunity to get to know you, learn about how you move, how you feel about movement and most importantly what you feel comfortable with. We also want to know what you would like to achieve from your classes – that way we have a better chance to create a program that meets these needs and to guide you into a class that will suit those needs. For example if you are coming to Pilates from an injury then a group reformer class would not be appropriate and it would be irresponsible for us as professionals to advise you to join a class where you are limited with how much can be modified and adapted to suit your needs. By spending one on one time with your instructor we are then able to choose exercises within the Pilates repertoire that are specific to your body and goals and suitable for your level of movement and fitness. Understanding the principles of Pilates and the how and why you would or could do something is very important in terms of achieving short and long term goals. By seeing you for an initial consultation we also have a baseline from which to measure your progress. At Core Pilates we offer the opportunity for reassessment every three months so that you can measure your progress and discuss any changes you might want to make. Perhaps you are feeling confident and would like to work towards performing a particular movement that is more advanced, perhaps you wish to focus on something activity specific – everybody has different goals and we all need them. As instructors our goal is to tailor the program to your needs so that we can help you achieve the desired result. We are always here to guide you and our job is to help you find your power. 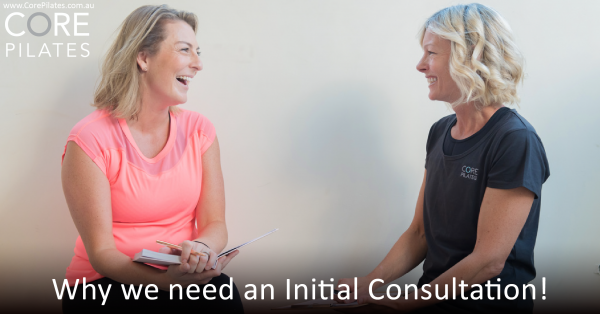 So what does an initial consultation at Core Pilates involve? Discuss any relevant points noted on your client questionnaire. We may ask you what sports you play, do you look after grandchildren, do you spend a lot of time on a computer? All of these questions are designed to help us program exercises that will help alleviate some of the stress placed on your body from these activities and achieve optimal performance. Your instructor will take a look at your posture and make some notes. We will check your balance, whether you can squat and test how mobile your spine is. You will then learn the foundations of Pilates. We do this by taking you through a series of exercises that can be termed as ‘Pre-Pilates’ and similar to exercises that you may be given by a physio. This is for us to see how your muscles are activating and how well your body moves. It also gives us the opportunity to teach you about the breath and the how and why of each Pilates movement. You will notice as you move through your sessions that the foundations apply to all of the harder, more traditional Pilates exercises that follow. The exercises progress over time and will become your warm up each week. You will then experience the apparatus called the Reformer. You will be shown how to safely move around the Reformer and learn the foundation exercises on this piece of equipment. You will be given some appropriate release exercises to finish as your instructor discusses the best options for you moving forward. One of the primary principles of Pilates is commitment, you won’t really know after one session whether it is for you or not, some people are hooked right from their first session, others take five to ten classes to really feel it in their body. To create change we must commit to changing so when you give Pilates a try give yourself time to have the full experience and then you can reap the full rewards as Joseph promises above….and delivers! So hopefully this explains the difference at Core Pilates Studio and why we consider it essential to have a thorough consultation. If you would like to book in for a consultation today, please do so here. We look forward to meeting you!